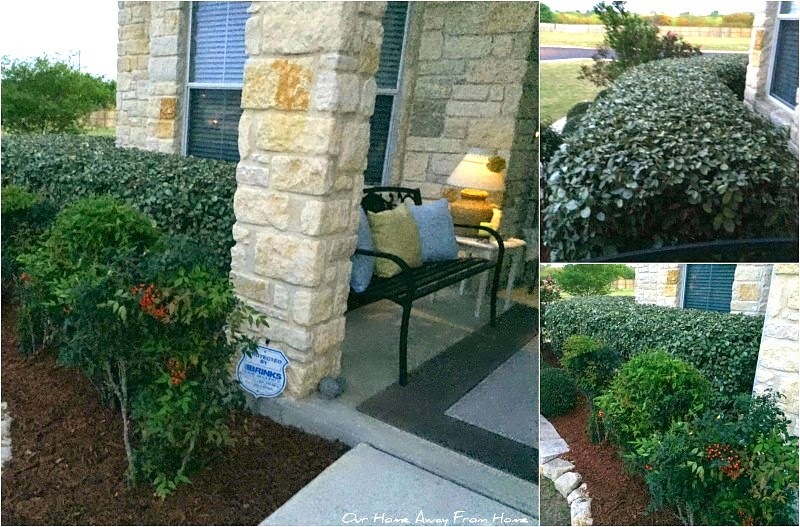 The first thing that got done was the flower bed. It sure was a mess after the winter months. 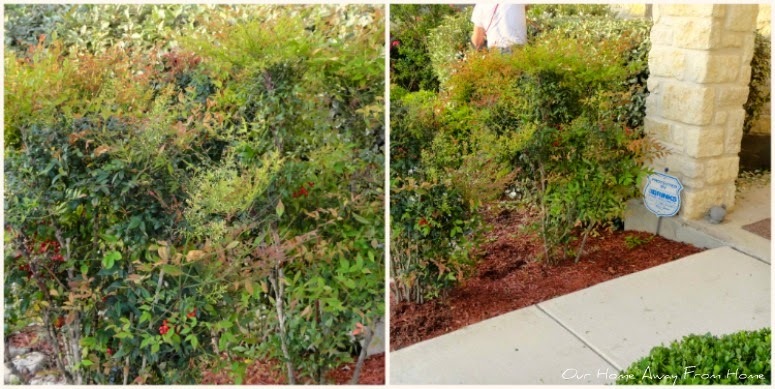 We do this twice a year, trim all the bushes down, rake all the mulch and clippings and add new mulch all around. It was a six hour job, but so worth it! 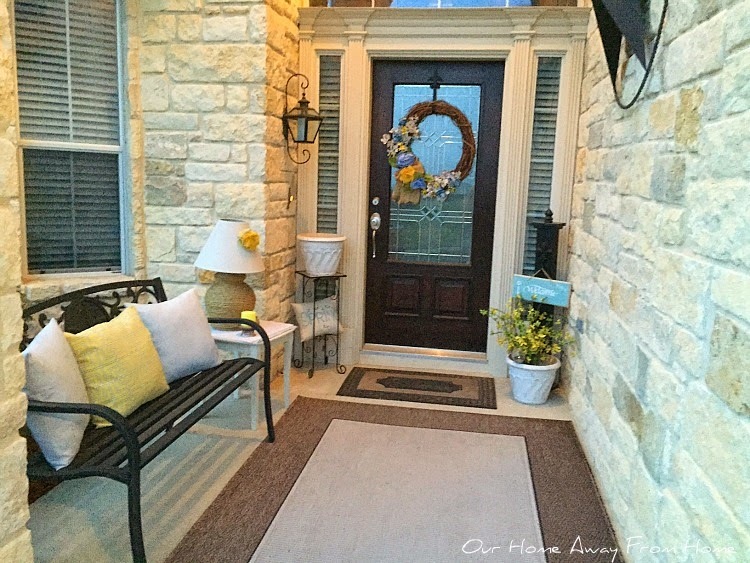 My Spring porch decor is really simple this year. 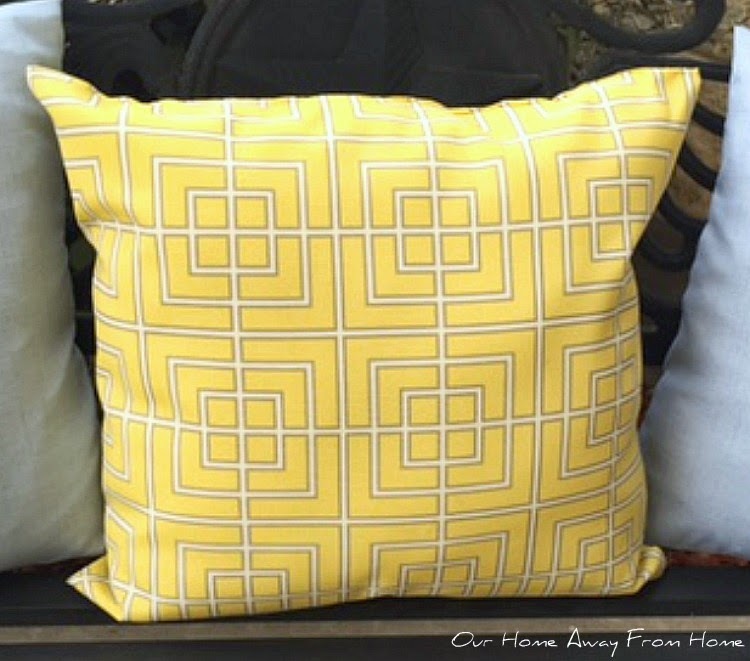 I used a yellow pillow I already had on the bench and made two in a soft blue outdoor fabric. 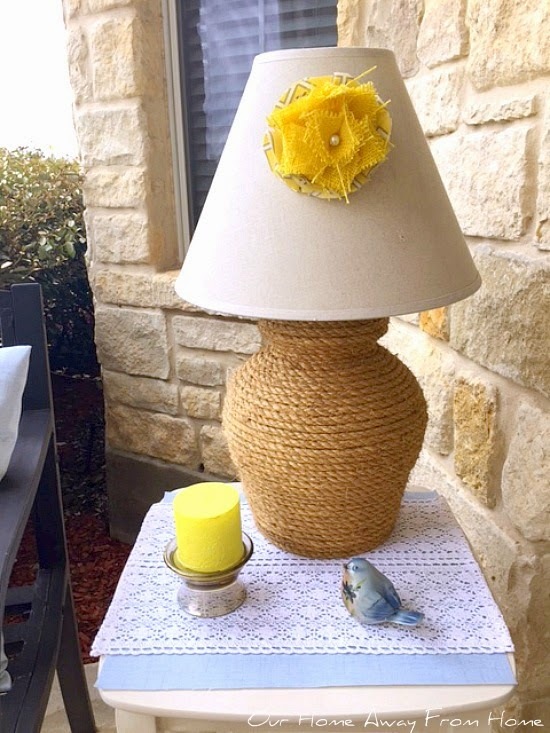 On the small table, I just added the solar rope lamp I made last year and a few yellow and blue touches. 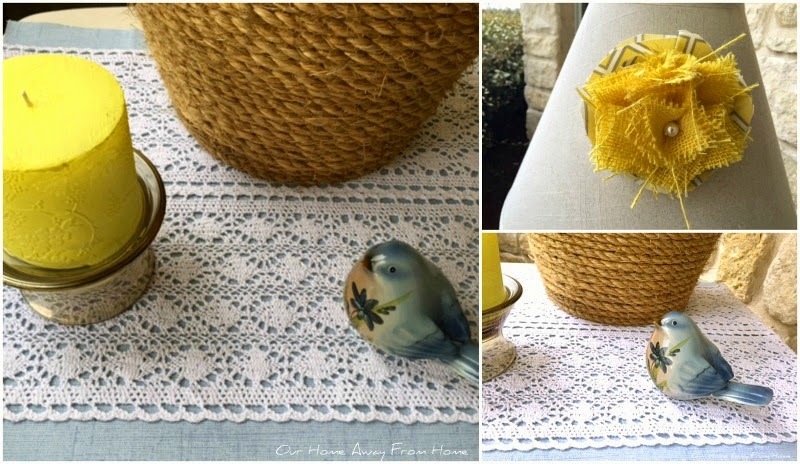 The outdoor white lace mat I found at Hobby Lobby. 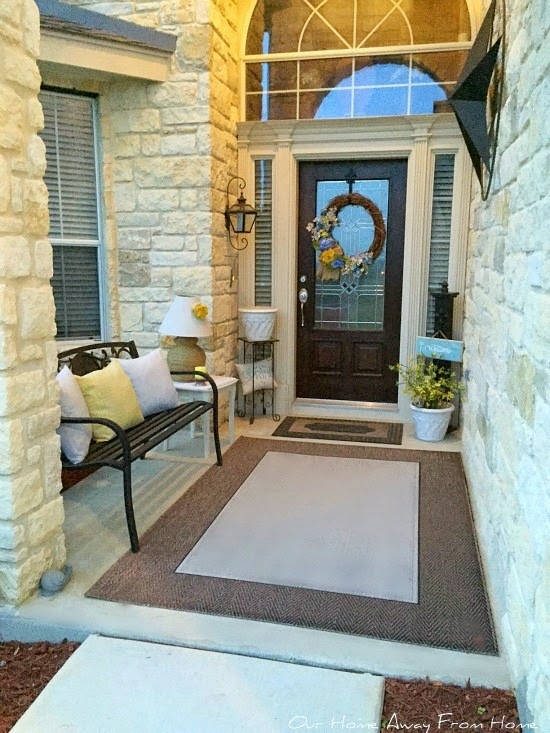 As you can see, I haven't even finished the area around the front door. The stand by the left side sits with an empty pot. Hope to be able to go out a buy a pretty green plant this week. 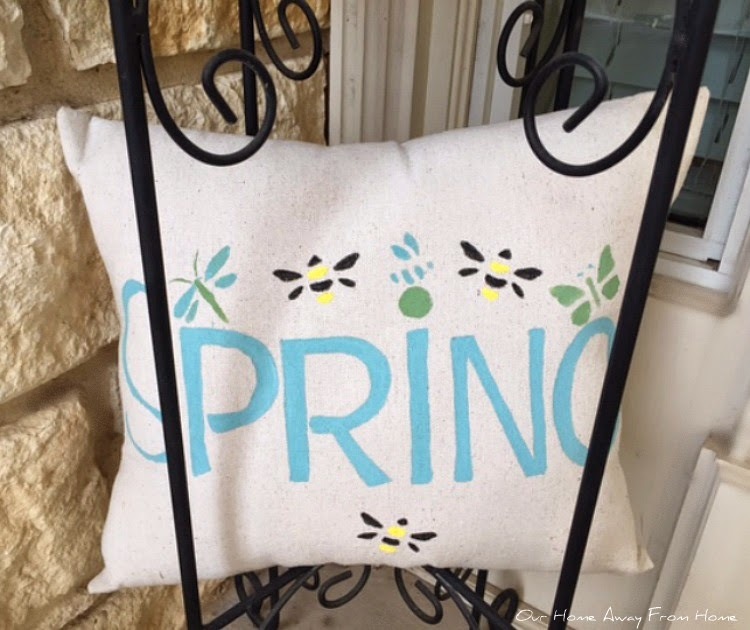 Meanwhile, it just holds the old Spring stenciled pillow. 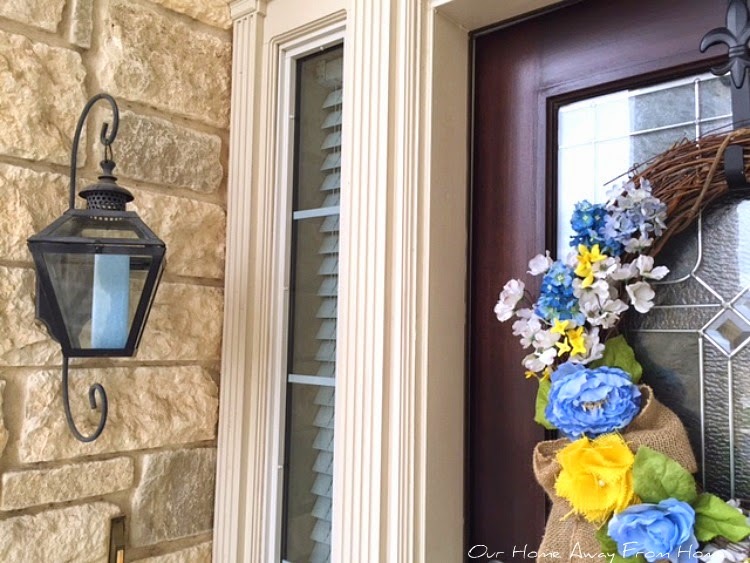 A blue, yellow and white wreath and the sign post give the front door a little bit of color. And here is a picture of the person guilty of grandma not getting anything done lately. I just can not get enough of those sweet cheeks and that wonderful baby smell. 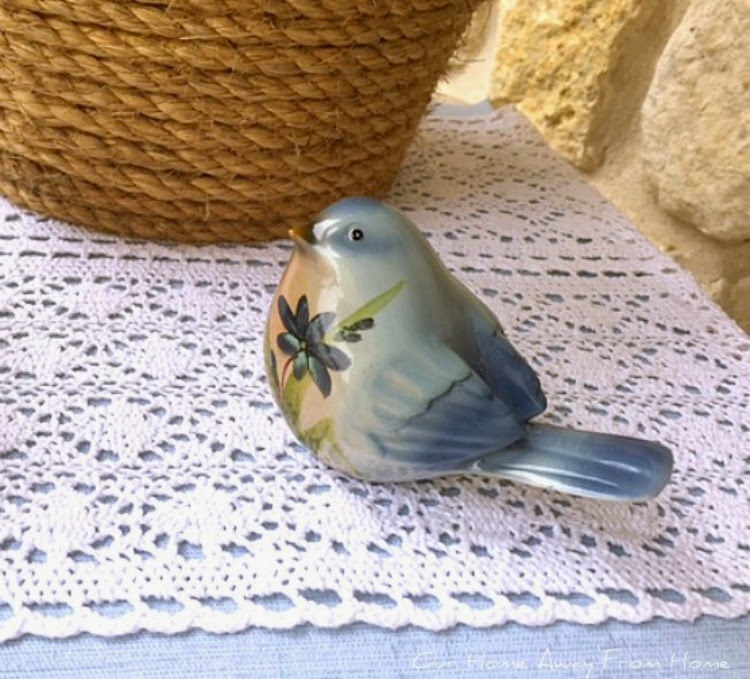 Thank you all for stopping by and enjoy the rest of your week! He's such a cutie, truly worth all the time Maria Elena! 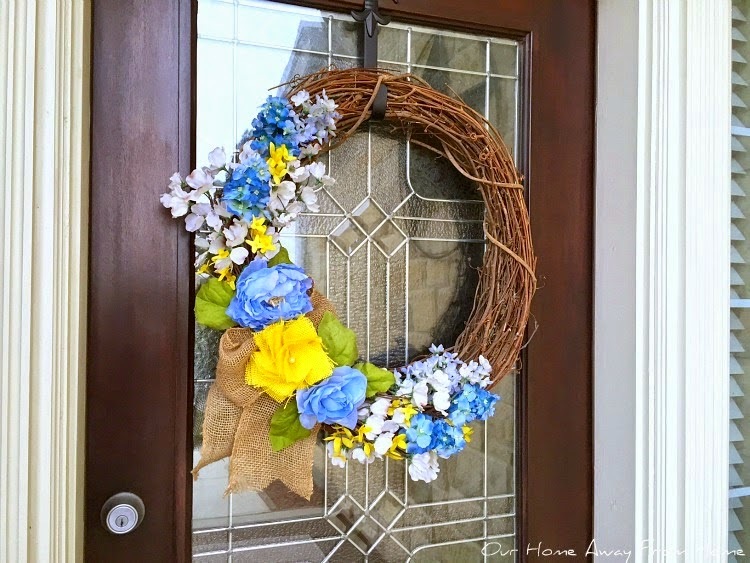 Your entry is lovely as always! 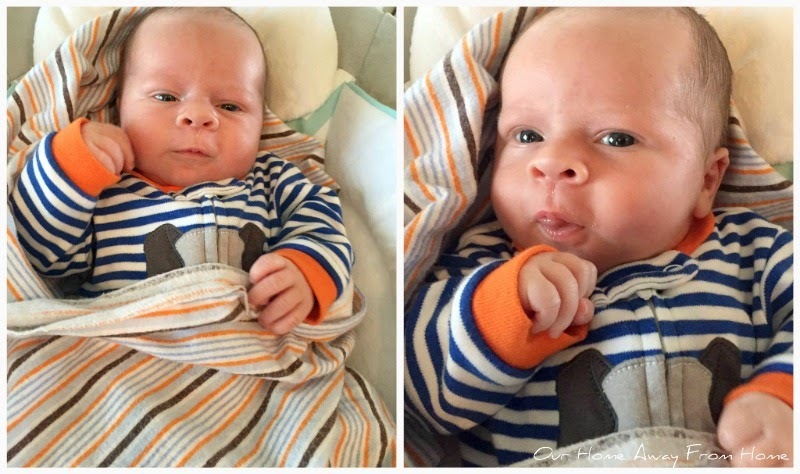 Everything is lovely, but your little guy stole my heart. I want one! 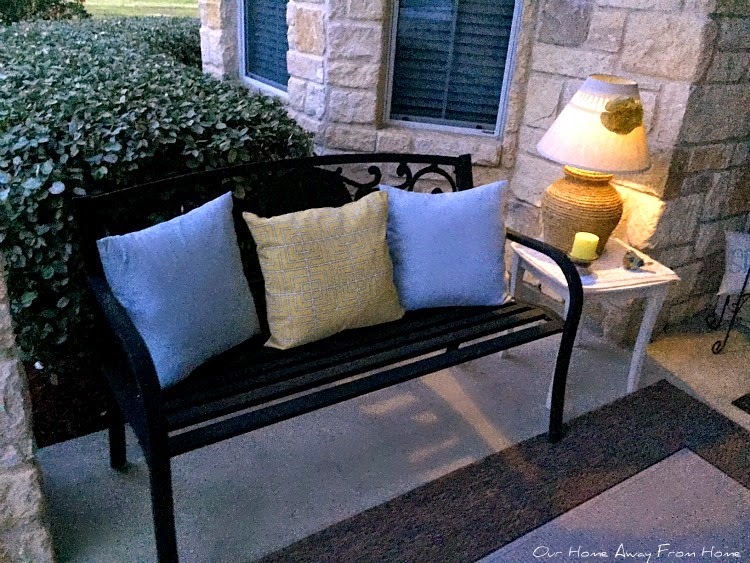 I just had the beds mulched today and now I must add some fun stuff to the front porch just to make it sing, like yours! 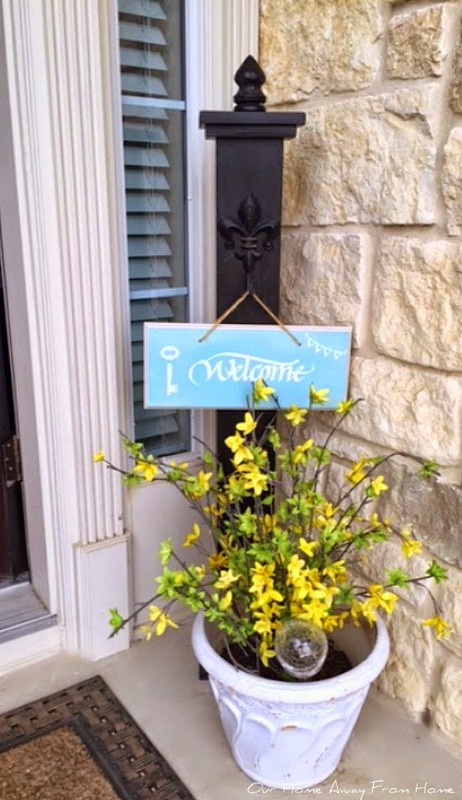 Your front entry looks great with the yellow spring-y touches. I am surprised you could take ANY time away from that darling grandson of yours - adorable! 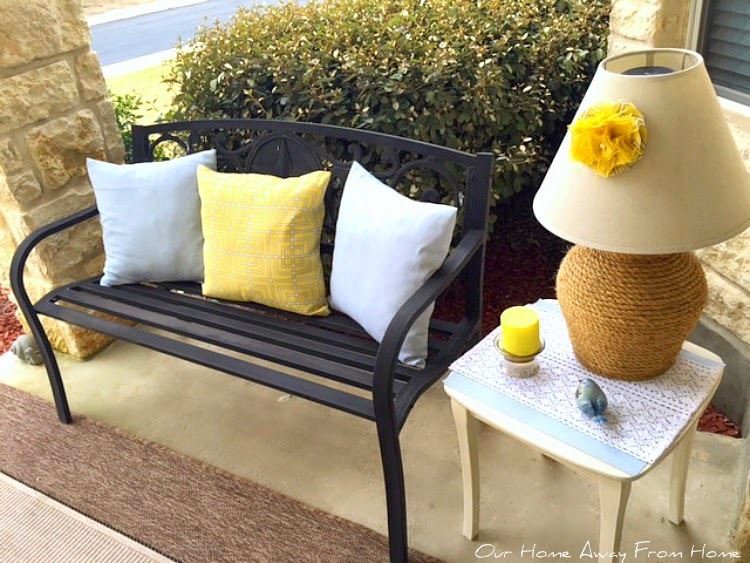 Your spring porch is looking great! I know it's probably hard to tear yourself away from that sweet baby! He's adorable! 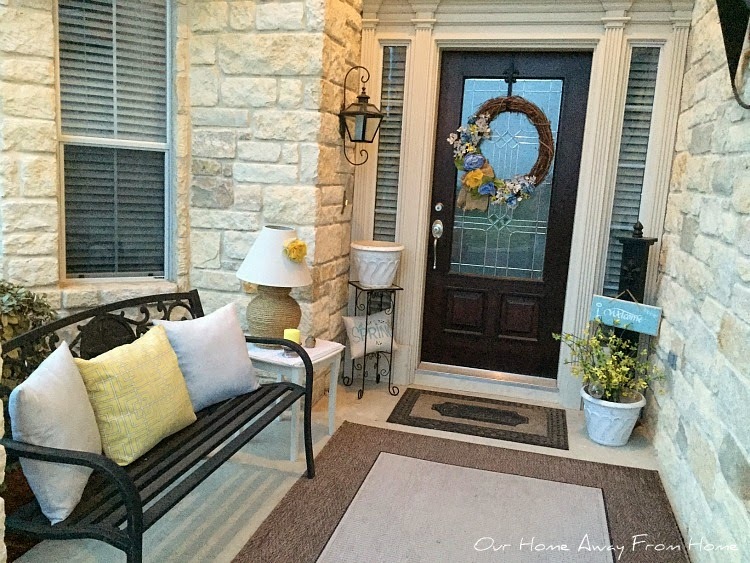 Well, I was all set to tell you how pretty your front porch and beds look, but then you show the baby and I lost my train of thought! I'm surprised you got as much done as you did with all that sweetness just waiting for cuddles. He is so adorable, Maria Elena! Very pretty! 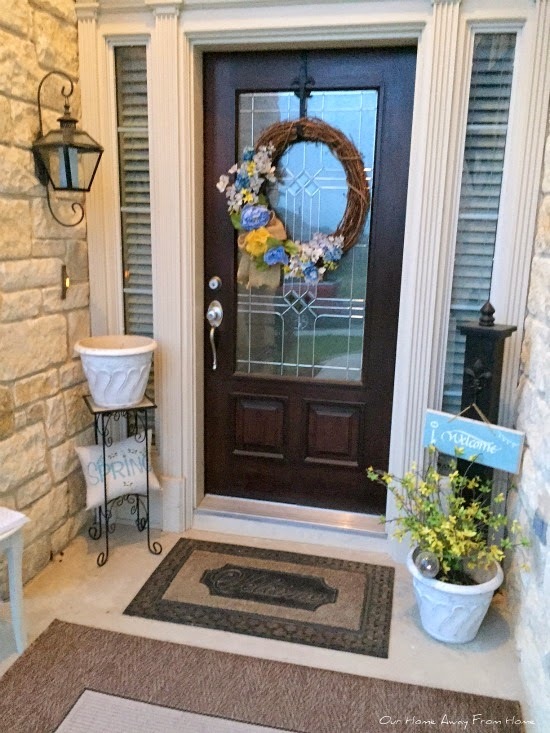 I love your black door! I want one of those little guys too :-) So sweet! Have a great day friend! A job well done, Maria Elena! 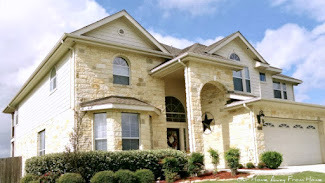 Now that you have a grandbaby to dote on just getting small things done around the house can be a big accomplishment. : ) Enjoy him!